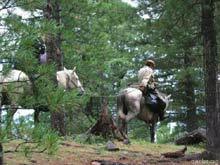 Usually you do not have great problems to rent horses and find a guide for this tour in Choito Gol. From Kothy Gol, head towards the mountains along the river Khubuitui. After approx. 16 km you reach a fork. The way to the right leads directly to the Shumak pass, however, take the way to the left towards the Khubuitui pass. On the way you will find a hut to stay over night. After crossing the pass continue your journey either along the shores of the river Baron Gol or the river Sun Gol. The rivers meet later downstream to become river Ara-Khubuitui, which flows into Ara-Oshui a few km further. From there follow Ara-Oshui down to the valley of the Shumak springs. Since you have to bring the horses back, try the Shumak pass route on your way back.